We’re now in our third year as missionaries in the Philippines. We just returned from Cebu, where we went to apply for new passports at the American consulate. Mine is only four pages from being full, bearing visa stamps from Canada, Indonesia, Singapore, and China, as well as six pages eaten up by coming in and out of the Philippines. 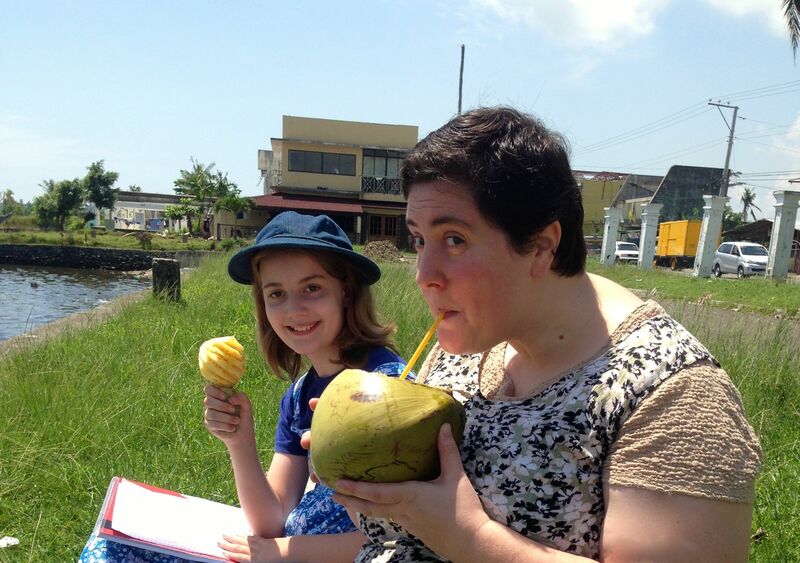 Hosanna and Isaiah applied for new passports as well, since theirs are due to expire in 2015. So we will have new passports in about six weeks. Then we will hope that our agents in Manila can get all our missionary visa stamps transferred into them. A year ago, we went to Cebu to vacation with Sora’s parents Mickey and Robin. This year, finding ourselves in the city again, we decided to turn a once-in-a-lifetime experience into a twice-in-a-lifetime experience: we went to nearby Oslob to swim with the whale sharks again. The seas were high with swelling waves, and the younger three kids mostly clung to the outriggers of the boat. But I was able to swim around, and the whale sharks came right up to us. There must have been six in five minutes. Sora got bumped by a tail. The water was a bit murky, and the whale sharks’ camouflage was all too effective. The result was that they frequently appeared out of nowhere, and I had to scoot to get out of the way. Today is our first day back in Davao, and I returned to more ordinary life: reading Latin with my homeschooled students (a prose retelling of Aeneid I in Ørberg’s Lingua Latina: Roma Aeterna) resuming my classes at Faith Academy. On arriving on campus, I found that the new high school building, under construction since early last year, had at last been opened for use. I have a new classroom! 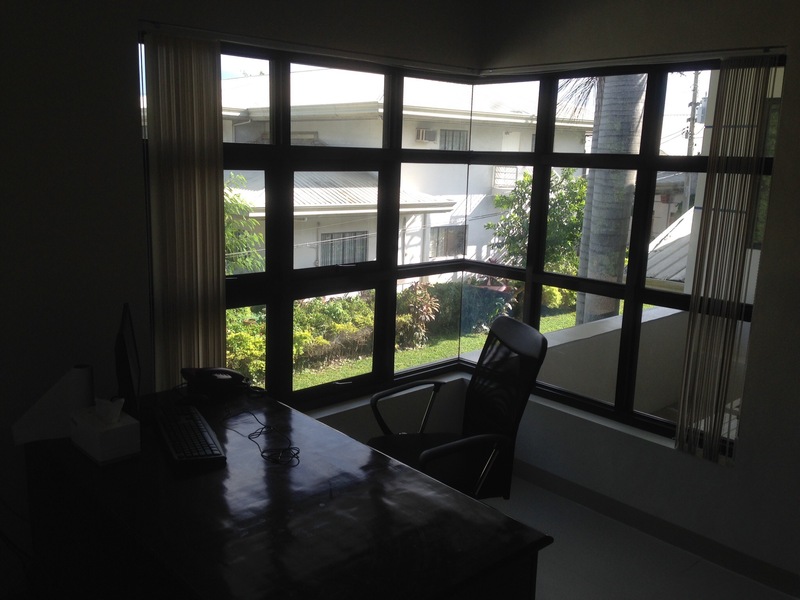 And what a room it is: big, spacious, beautifully well lit with skylights, and a view of the SIL campus out the corner window. It will be a joy to teach in this space for the coming year. We appreciate your prayers and support in 2015! Waiting for breakfast at the Haiyan Food Stop, refreshed after a good night’s sleep and ready for another day! After our two long days of driving, we slept late on Tuesday morning. The grand opening of Cumpio Midwife Clinic was not taking place until evening. 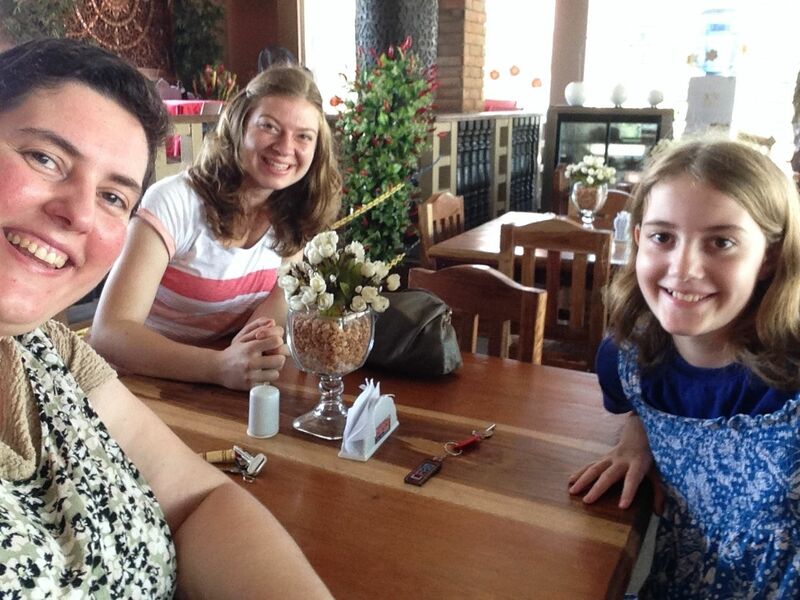 We ate a delicious breakfast and set out for Tacloban, about half an hour away. Our delays the previous day meant that we would not have time to see all the places that I’d hoped to visit with Naomi and Gabriela, but we meant to make the most of the time we had. 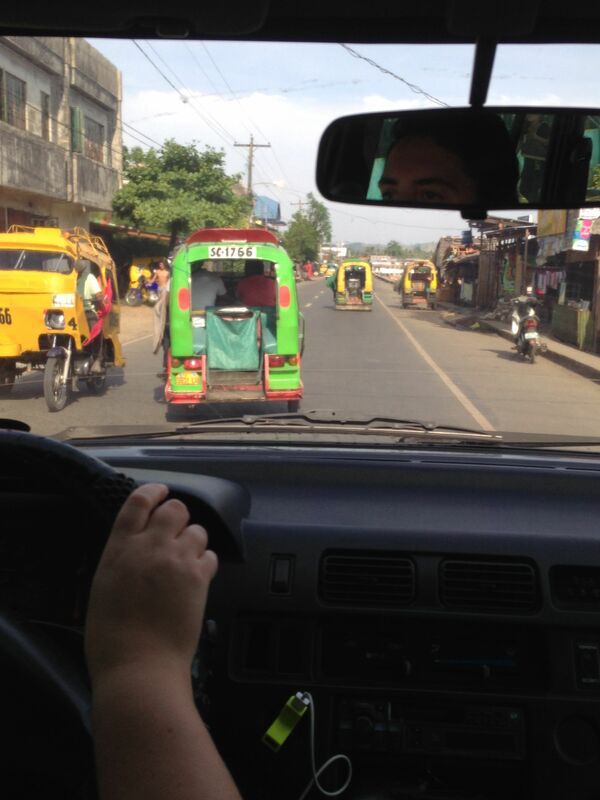 Driving to Tacloban, I was amazed at how many changes there had been in the 5 months since I had left. It was so encouraging and heartwarming to see shiny new roofs where six months ago there were weather-beaten tarps. The recovery and rebuilding had clearly come a long way! Morning refreshment — fresh buko juice (coconut water) and tiny single-serving pineapples, eaten off the stem like a lollipop. Naomi and Gabriela agreed that of the various landmarks that we could visit (the scenic Leyte-Samar bridge, the MacArthur Landing Monument, the several large ships that had been washed into town by typhoon Yolanda) they were most interested in the Sto. Nino Shrine and Heritage Museum, built as both a museum and one of the 29 residences of President Marcos and taken over by the Philippine government in the 1980s after Marcos was ousted. Tacloban is former first lady Imelda Marcos’ hometown, and the museum was built on her family’s property. The mansion suffered extensive flooding and damage during Yolanda (link goes to a news site photo slide show) but has since re-opened. Our tour guide, who told us she was already part of the staff in the days when the Marcos family still used the residence on their visits to Leyte, was clearly devoted to the building and grieved over the damage caused by the typhoon. 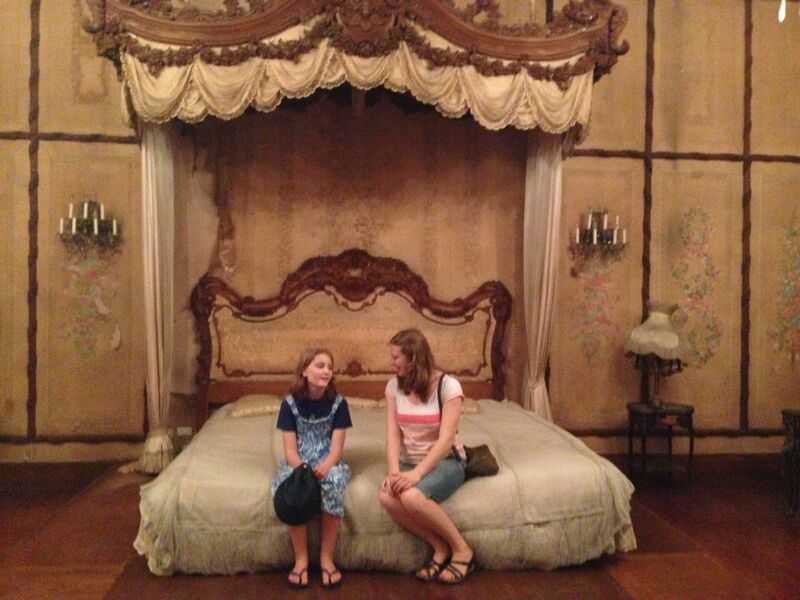 Despite the storm damage, the girls were impressed by the grandeur and opulence. 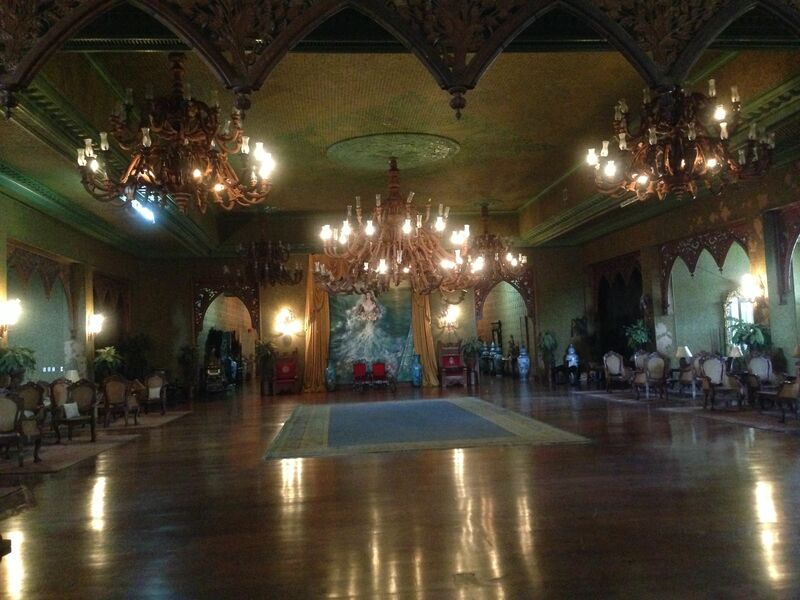 The ballroom with its enormous, octopus-like chandeliers. Naomi was particularly fascinated by the dioramas depicting Imelda Marcos’ life, from her childhood in Leyte to her benevolent good works as First Lady of the Philippines, in each of the downstairs guest bedrooms. 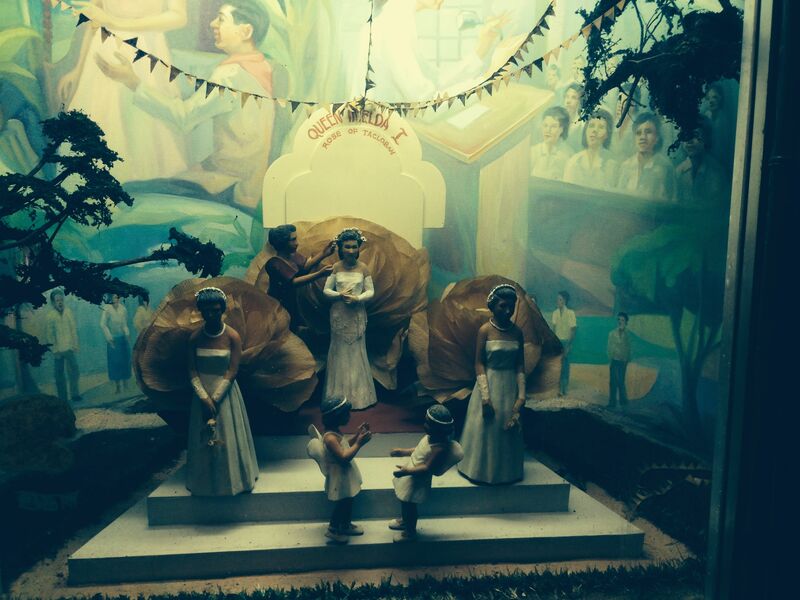 Example of one of the dioramas: a youthful Imelda is crowned beauty queen. This picture does not do justice to the size of the room. The luxurious ensuite bath was quite a big larger than my bedroom. Our tour complete, we left Tacloban and headed south to Dulag, where I had spent four weeks in the spring volunteering at Bumi Wadah’s “birth camp” clinic, which at the time was located in San Jose elementary school. We drove past the school, which is in session but still under construction (a Japanese NGO began repairs to the school shortly after I left Dulag.) Bumi Wadah has a lovely clinic building now which they share with the rural health unit. 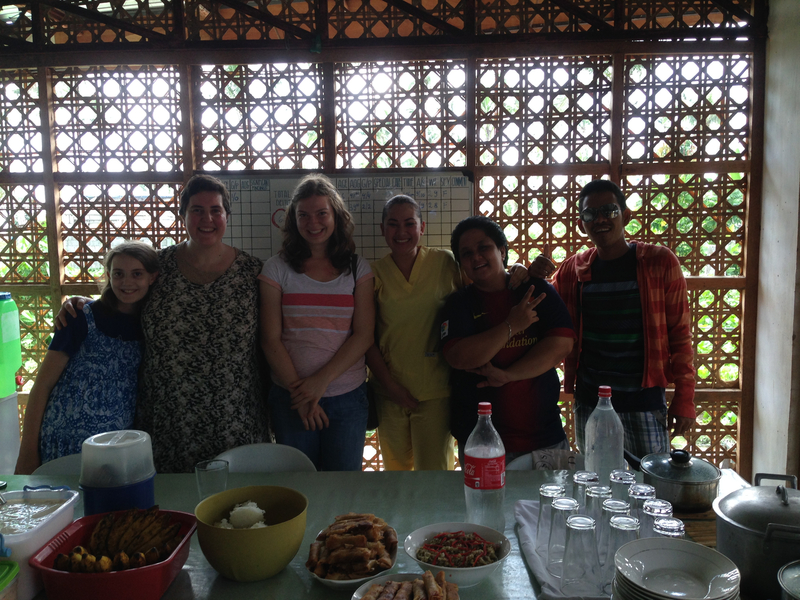 We visited there and were treated to a delicious lunch (eggplant salad, pumpkin soup, rice, vegetable lumpia, and fruit salad – yummy!) Because our lunch visit was a day later than planned, most of the midwives were attending a seminar and I would not get to see them until later that day at Nerissa’s opening, but it was great to see the new clinic building and see old friends again. One of the things I enjoyed most about my time in Dulag was the beach right across the street, where I went walking almost every day unless it was pouring rain or we were extremely busy with patients. In Davao, it’s easy to forget we’re on a tropical island since the city is so built up and the water so polluted — to get to a beach from Davao we have to drive a long way down the coast, or first drive and then take a boat to Samal Island. So after lunch we walked across the street to enjoy the fresh ocean breezes and the lapping waves. 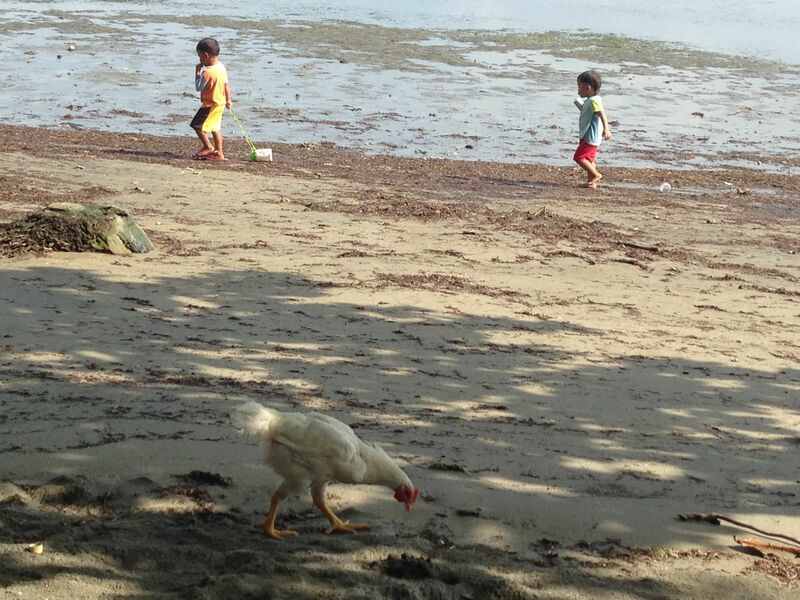 Naomi enjoying the beach in Dulag. On the beach, as well, signs of recovery were evident. 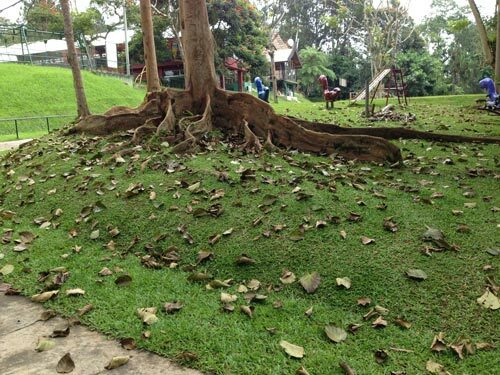 Though the debris of ruined houses remained in many places, the surviving coconut trees, which had been almost bare of leaves in March, were green again and new fishing boats lined the beach. 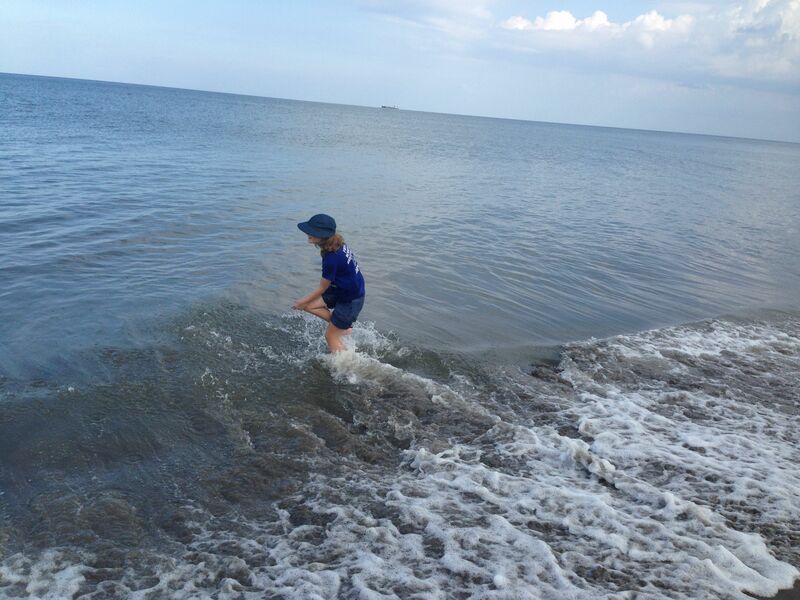 Naomi splashed in the waves while Gabriela and I visited with a new Bumi Wadah midwife volunteer who had just arrived from Australia. All too soon, it was time to head back toward Tanuan, for the most important event of our trip: the grand re-opening of Cumpio Midwife Clinic. A few weeks ago, I got a message from Nerissa Cumpio. “Good morning Sora, the opening will be on September 16th, I hope you are available that day.” For several months, I’d been getting updated photos of the building project progress and finally, the date was set for the (re)opening celebration of Cumpio’s Midwife Clinic! I immediately started to plan my trip. 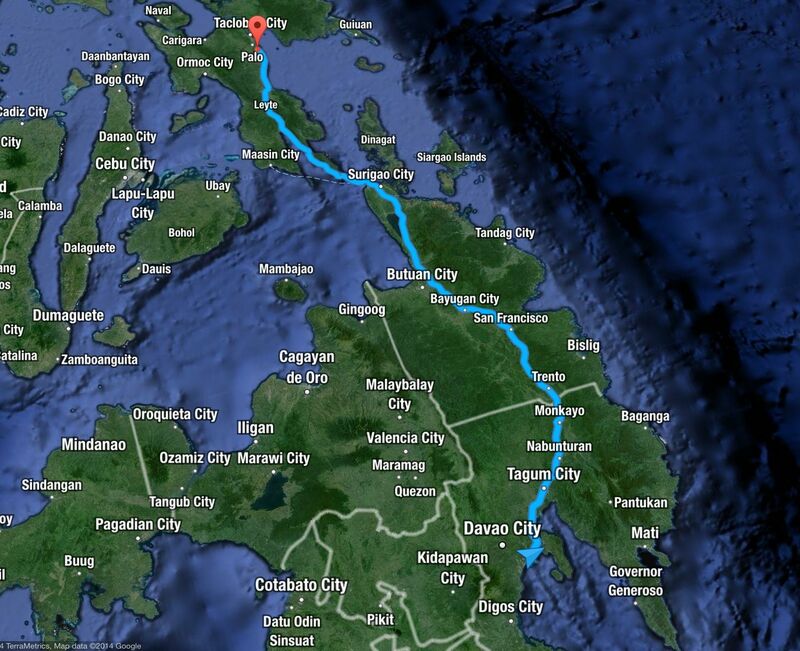 Rather than fly into Tacloban airport, I decided to make it a bit (more) of an adventure and drive to Leyte. I figured that the cost for gas and the ferry would be comparable to flying and that this plan would allow me to see more of the Philippines, and bring Naomi and Ezekiel with me. Unfortunately, I had a very tight schedule for when I needed to return to Davao, requiring some very long days of driving! Ezekiel decided the long days in the car did not appeal to him, and Matt had classes to teach in Davao, but Naomi came with me, along with Gabriela, one of our friends from Davao. We set off on Sunday afternoon, well-provisioned with snacks and water bottles. The plan was to drive from Davao to Surigao City on the north-eastern tip of Mindanao, spend the night there, and take a morning ferry, reaching our final destination in Leyte in time for lunch. I had not been able to find a working phone number for the port or the ferry company in order to confirm schedules, but I had the all-important copy of my vehicle’s OR and CR and I had found what looked like a fairly recent ferry schedule on a travel website so I wasn’t too worried. The drive from Davao City to the ferry terminal in Surigao City is estimated at just over 5 hours by the google maps app. All I can say, is, whoever created the algorithm for the google maps travel times must never have driven in the Philippines. 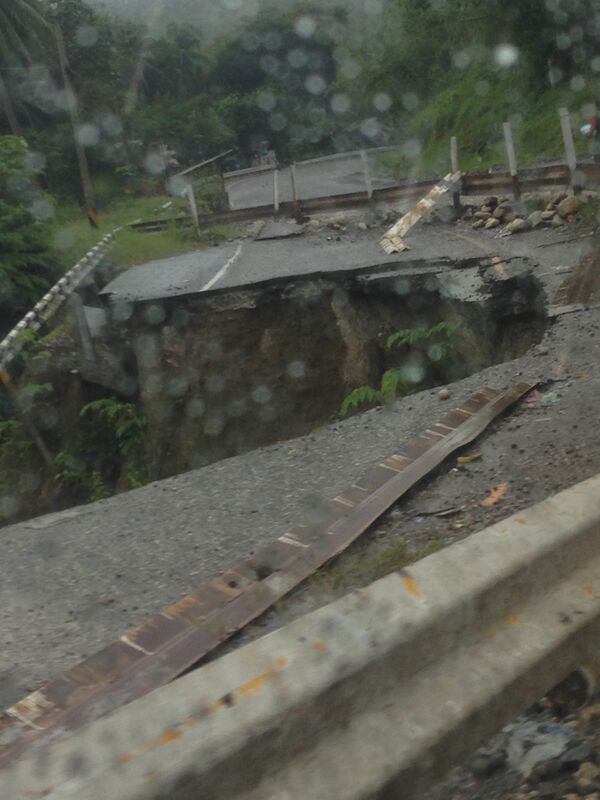 Our trip was on the Pan-Philippine highway the entire way, but most of the Pan-Philippine highway (outside of the major cities) is only two lanes, and there are frequent landslides and bridge repairs requiring constant maintenance. We slept well and arose bright and early, headed for the ferry about 10 minutes away. As we got closer, the lines of parked cargo trucks on both sides of the road led me to suspect I might have made a tactical error in not taking the time to visit the port the night before. My inquiries at the port quickly confirmed my suspicion. I was permitted to hand in a photocopy of my vehicle registration to secure my place in line, but not to buy a ticket yet. I was told the morning ferry was already full and the noon ferry was “probably” full as well. The driver of the first car in line to board informed me that he had arrived at the port a little after midnight. Ooops! I texted my friends at the birth camp in Dulag to let them know we would not be there for lunch after all (“Maybe supper, then?”) and we decided to make the best of it by driving around Surigao to see the sights and maybe finding a (more pleasant than the ferry terminal) place to relax for a few hours. 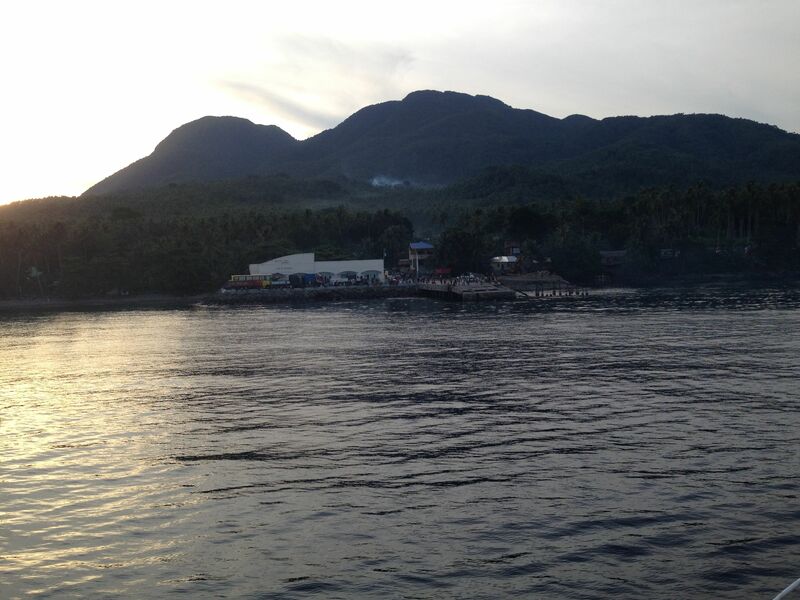 The Surigao beach where we spent most of Monday morning. We bought some pandesal at a local bakery and found a place where we could rent a beach cottage (picnic table with a roof) for 100 pesos. Naomi played in the water and Gabriela took a nap. We’d been told to check back in at the ferry terminal at 11:00 am, so right on time, we headed over. The ticketing agents were clearly overworked and stressed. When I finally got their attention, I was told my name had been called half an hour before! (I protested that I had left my cell phone number… but that was with a different agent, who had gone off duty in the meantime.) It was okay, we still had our place in line for the next ferry and were allowed to buy our tickets — a multi-step process involving no less than 5 different people all in different offices. I continued to hope for a lunchtime departure though there was no sight of a ferry yet, we parked our car where we were directed… and waited. 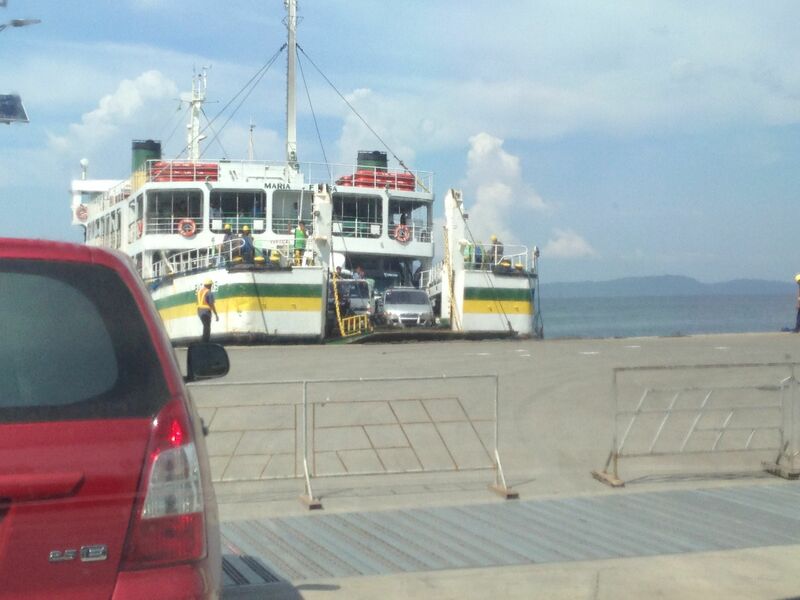 The ferry showed up around 2 pm and unloaded. Then the loading process began, and I realized this was going to take a while. The order of priority for ferries is passenger buses (which get on the next departing ferry after they show up), private vehicles (like mine, which apparently usually need to wait a while!) and finally cargo trucks, which explains the lines of trucks on the side of the road leading to the port. And all of these vehicles, crammed as tightly as possible in order to fit as many as possible, are required to back into their place on the ferry… the ramp only works on one side of the boat. The crossing itself was pleasant and uneventful, taking a little over an hour. The sea was calm and by leaning over the side into the breeze we could avoid the smell from the large truck full of pigs directly below us. Though there was some nervousness in certain quarters due to the unfortunate ferry accident that had occurred just two days before, I saved all my anxiety for the night driving. 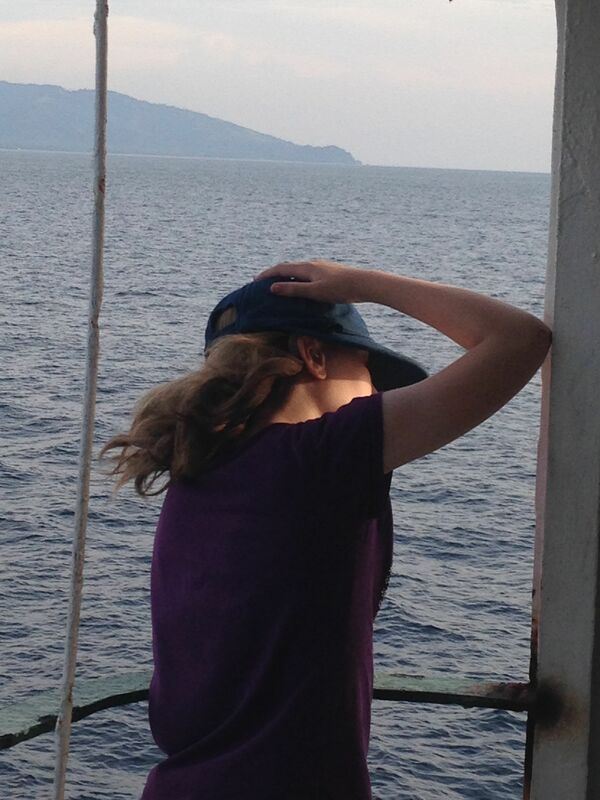 Naomi, enjoying the fresh sea breeze and avoiding the smell (though not, alas, the sound) of the pig truck. The welcome sight of the Benit (San Ricardo) ferry terminal, late afternoon on Monday. Unfortunately, we still had 170 km to drive, mostly in the dark, on winding mountain roads. Again, we pulled into our destination around 10:00 pm, tired from a long day of travel. Nerissa and her husband Alex were waiting to meet us at the Haiyan Foodstop, a restaurant built after (and named after) the typhoon. The Haiyan hotel is still under construction but two guestrooms are open, and that was where we were staying for the night. A joyful reunion and a good night’s sleep (with no 5:30 am alarm this time!) and we were ready for the next day’s adventures. We have many friends in Davao City now, but it is still loud, smoggy, and hot. 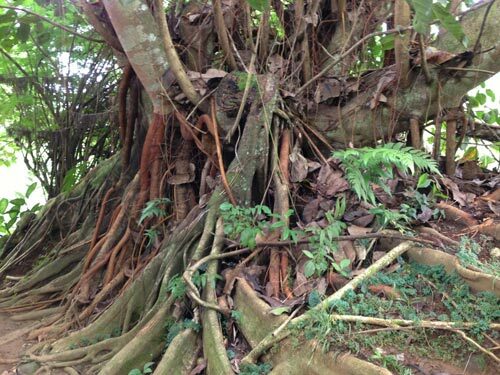 Our family has learned to manage it by getting out of the city every few months, taking a day trip or an overnight to somewhere quieter, cooler, and more relaxing. 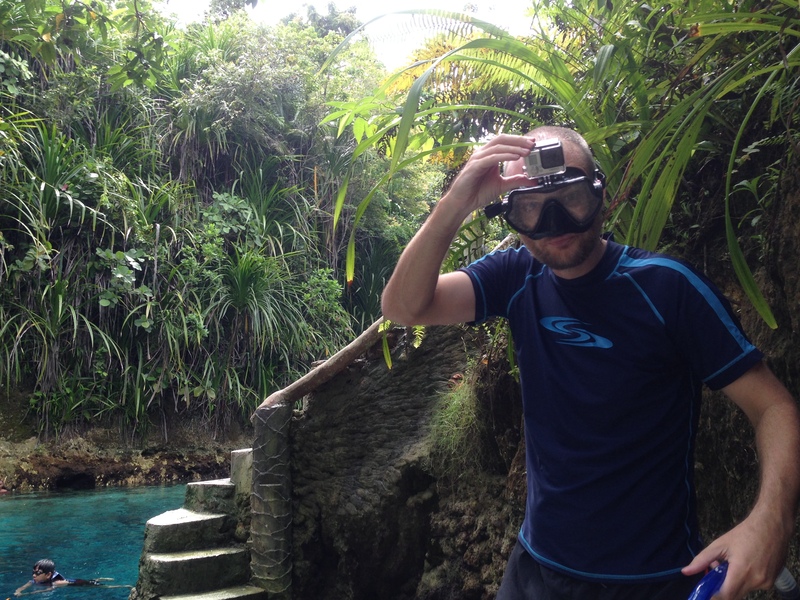 In July, we drove to Surigao to stay overnight in Bislig City and visit Tinuy-an Falls and the Enchanted River. Tinuy-An Falls is “the Niagara Falls” of the Philippines. Hosanna, normally so fond of mugging for the camera, for some reason didn’t really want to cooperate with any family pictures, so her recalcitrance is here memorialized for posterity. 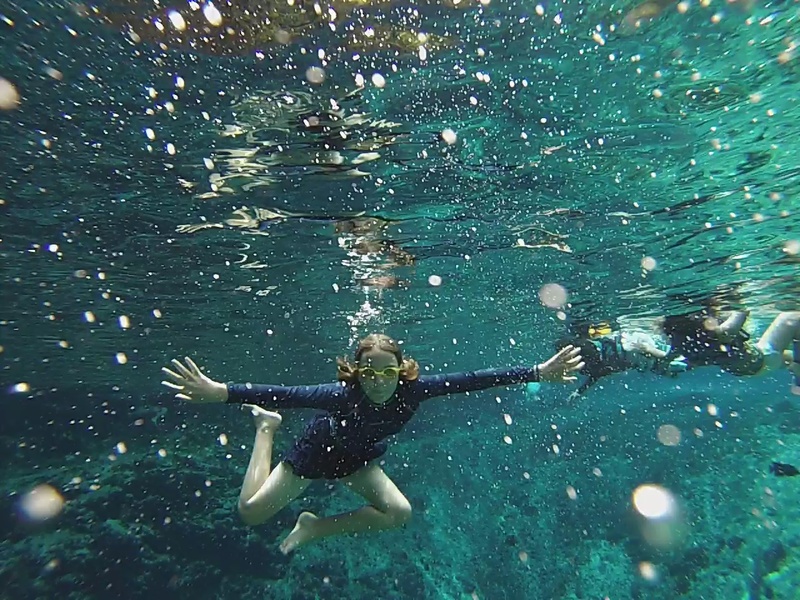 During our last trip to the States, we bought ourselves a new toy: a GoPro for taking underwater shots, and a special snorkeling mask to mount it on. 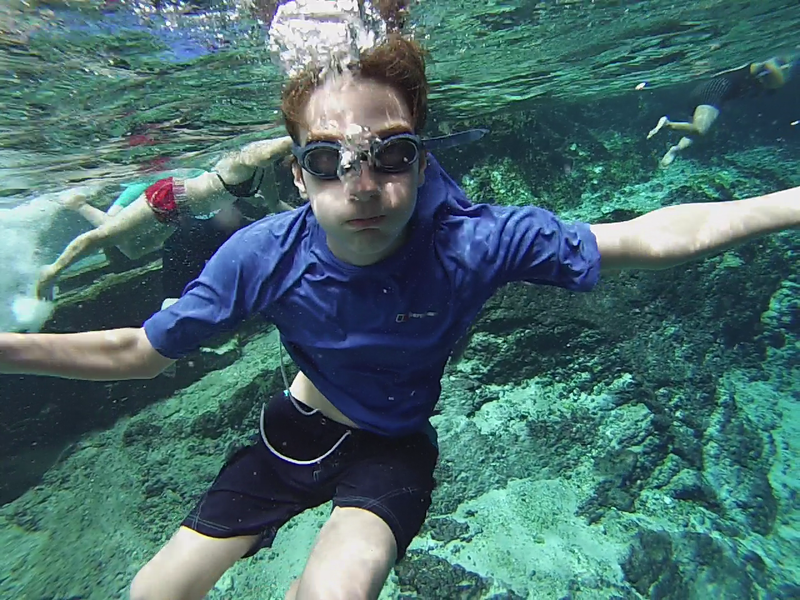 It saw good service at the Enchanted River. 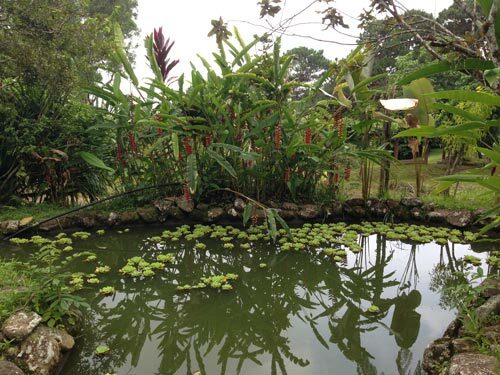 (The water at Tinuy-An was too murky for pictures.) 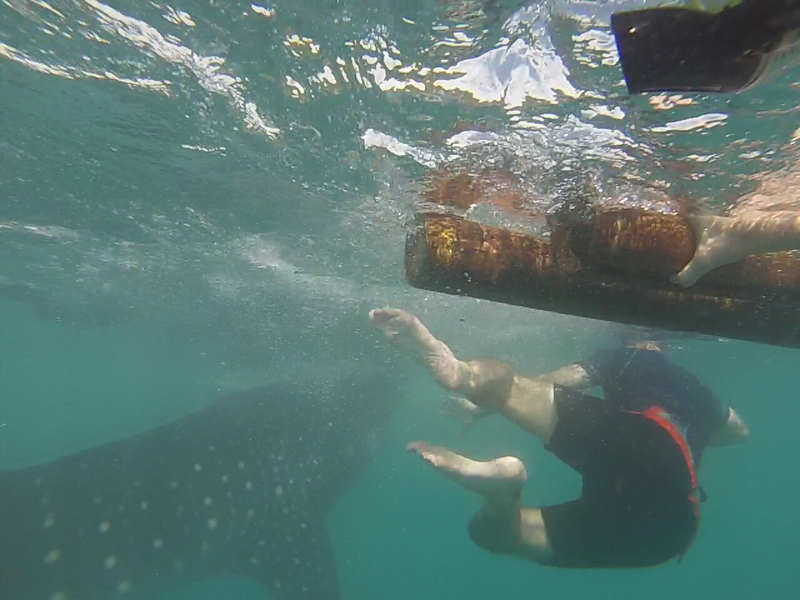 We hope to take it back to Cebu next year for another swim with the whale sharks. Matt diving in above the bottomless pit. 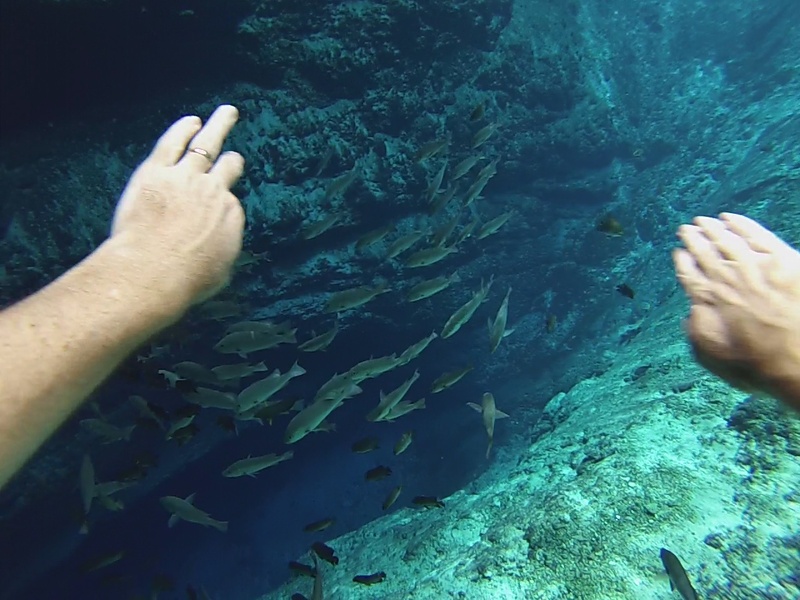 The schools of fish swam at leisure, unperturbed by diving visitors. I didn’t have all of the photos from Sora’s phone when I posted earlier. Here are some more shots from our three-day retreat for the Faith Academy Mindanao faculty orientation. 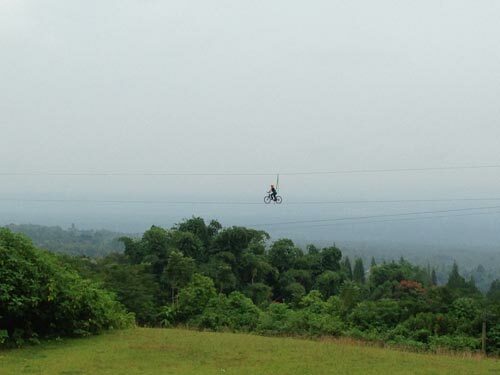 A bicyclist riding the zip lines like a scene out of ET. 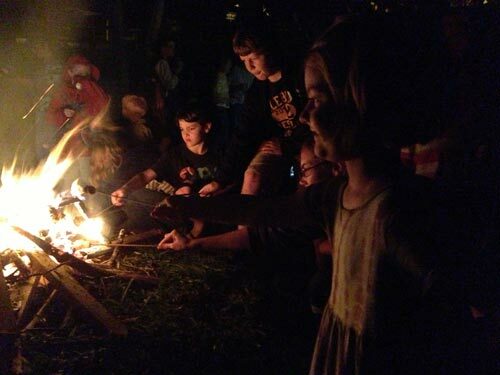 Hosanna and Isaiah roasting marshmallows with other FAM faculty kids. 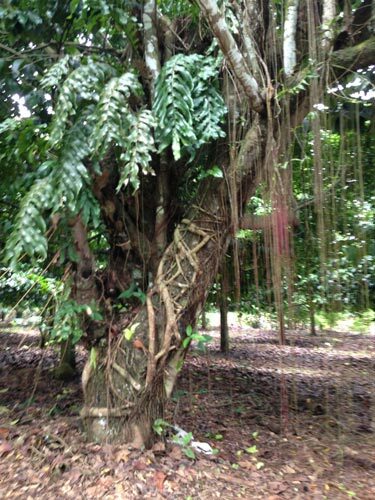 Tree ferns can be up to 20 meters tall. Isaiah found one of these plants already snipped off and carried it around, looking like a young Bacchus with a thyrsus. 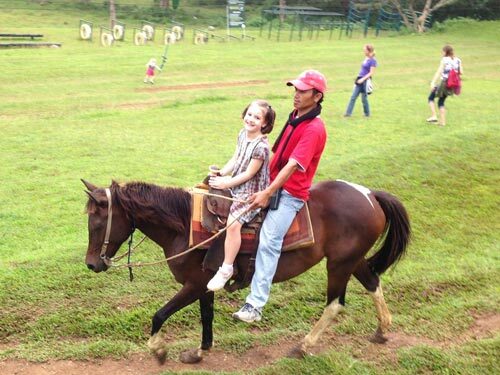 Hosanna greatly enjoyed a horseback ride.